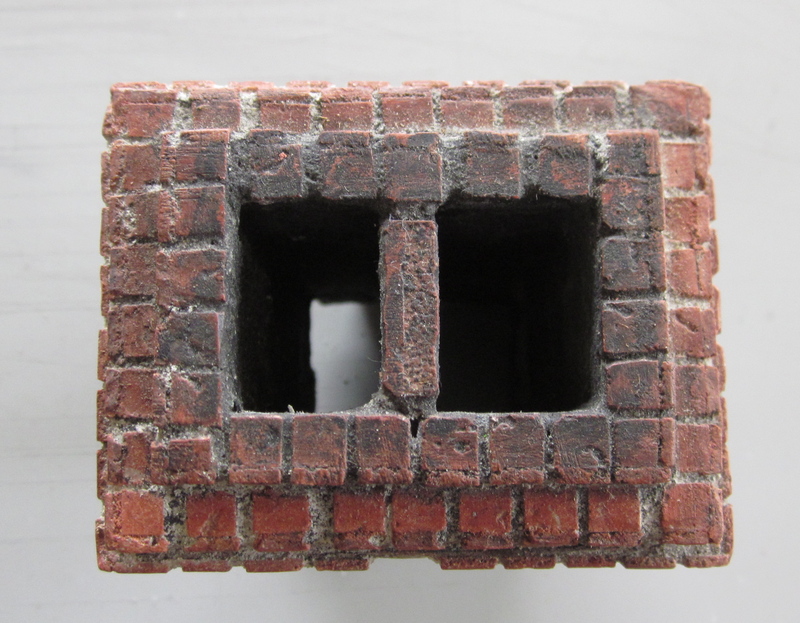 Last week the Den Mother of THE CAMP (the irrepressible miniatures chat group found at THECAMP@Yahoogroups.com) asked if I’d ever written about our bricks. While giving her the short answer, I remembered a brick story from the 80’s. One of the great things about building miniature Victorian houses in the 70’s and 80’s was the plethora of full-scale magazines on the subject, supplying us with quirky detail ideas. When we found an article on split-flu chimneys, perhaps in 19th Century Magazine, we couldn’t resist. The chimney began as a single flu, then split above the fireplace so that in the daytime, one could enjoy the light coming through a stained glass window over the fireplace, between the flus. The split flu then rejoined itself over the window and on up through the house. So we went to work installing one in the Port Townsend house, (see it live at the Kansas City Toy and Miniatures museum). There was a catch though, it had to work. I wanted to build it so we could burn incense logs in the fireplace and have it draft up the chimney, not leak through hidden gaps in the sides. We must have gone through a half a box of logs before we were able to seal up all the leaks, but eventually it worked. When we exhibited it at a 1981 NAME Houseparty, the security guard was so intrigued he kept the fire burning for us so everyone could enjoy the smoke curling out of the chimney top. 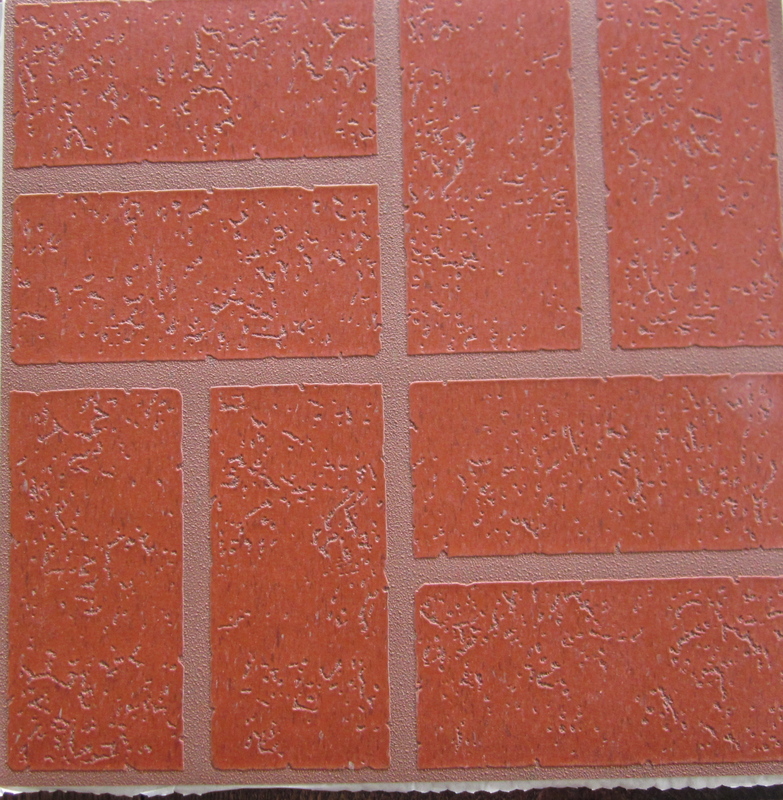 As for Den Mother’s question, I’m pretty sure I didn’t write about the bricks because the source material—Armstrong vinyl floor tile–disappeared from the world before I began writing about our work. I did, however, write about a good way to make similar bricks out of Fimo in an article posted on our website www.thomasopenhouse.com under “Tips.” And, there are a lot of brick options out there now which you might be able to adapt to look like ours. I recommend a thickness of 1/16”, as they are easy to work with and won’t “bulk up” your project the way thicker bricks do. The tiles we used were the old six-brick-to-a square pattern I remember seeing on kitchen floors in the 60’s. They were later replaced by an “improved” version, no longer vinyl, with a magnified texture, and coated in a thick no-wax plastic finish. Besides the awful finish, the new brick grain was out of proportion for miniature use. They went from something closely resembling brick to over-scale faux-brick. Before the good ones were phased out we bought 8 or 9 boxes of 40 tiles each (or 40 sq. feet per box). They joined the racks of rotting wood stored in our garage for future use. And that was the easy part. Preparation of the floor tiles was laborious and dangerous. First the sticky backing had to be removed because it balled up when cut into mini bricks, and prevented them from lying flat. Noel scrubbed the adhesive off with gasoline, then left the tiles outside to air out until the gas evaporated. That took a 5-7 days. Step Two was sanding the gloss off the front of the tile, face-mask in place. In Step Three we scored each tile into mini bricks 3/16” X5/8” using an Exacto. 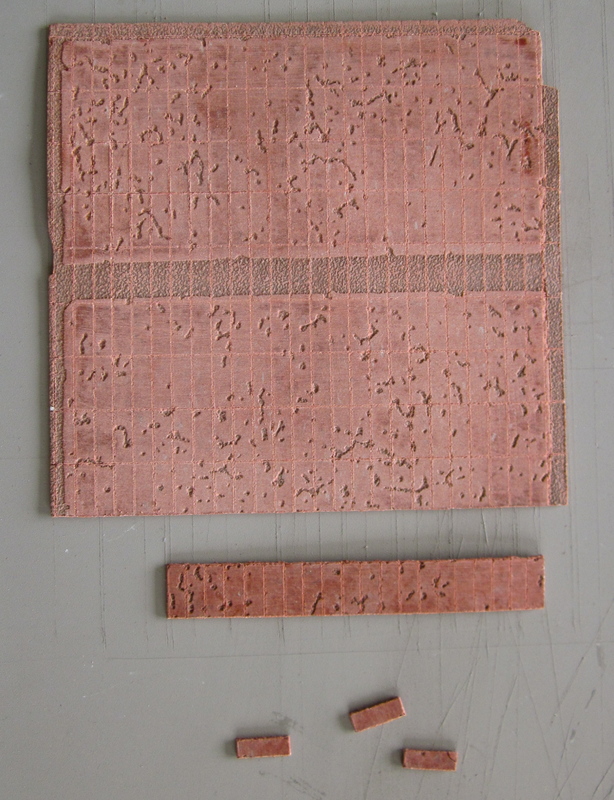 From there we broke them into strips, then individual bricks as we worked, gluing them on with Elmer’s white glue. If the courses traveled around corners, as in chimneys, we overlapped shorter “end” bricks with full bricks so the edges met smoothly, and the rows alternated as in the big world. We left somewhere between 1/32- 1/16” of free space around each brick for grout. 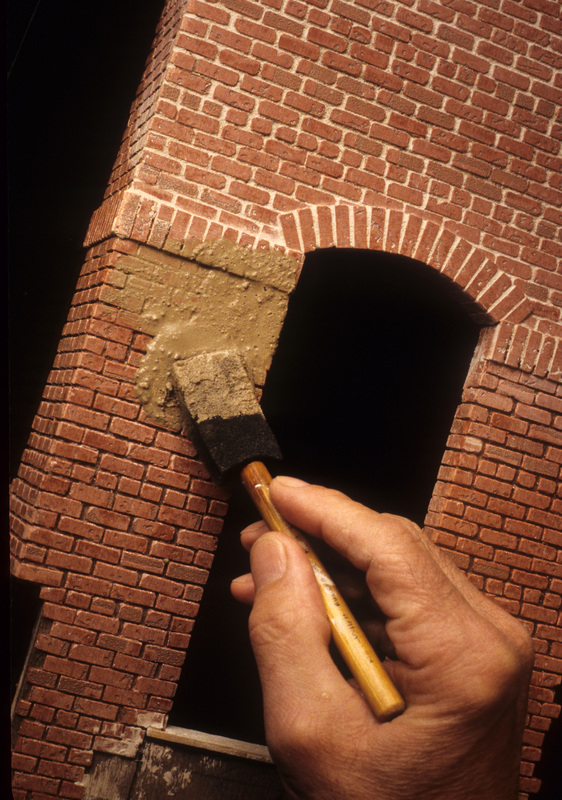 Once the glue dried we added some age by carving the edges of the bricks with an Exacto, and smoothed the corners (for chimneys) with a sanding block, pressing together the edges. For grout we used Quick-Plug cement (from the hardware store), mixed with a little cement adhesive (same department of the hardware store), and a little Dirty Water Wash (Mars Black and Raw Umber tube acrylic paint, and enough water to make a transparent muddy wash) to slightly darken the cement. That was all mixed with enough water to make a cement slurry that could be scrubbed into the brick with a foam brush. When the cement was nearly dry, we sponged the excess off the face of the bricks, and enough into the grout lines so they were slightly scooped, rather than flush with the face. The final steps included streaking them with more Dirty Water Wash some sap green tube watercolor for moss, and Mars Black right from the tube to make the soot at the top. Use your eyes. Look at real chimneys and what surrounds them (reason enough for a trip to Paris or Prague–their rooftops are the best!). It’s one of those areas where one can play with the subtleties of paint and aging effects, creating yet another element of that elusive illusion of reality. Chimney top blackened with Mars Black "soot"
This entry was posted in Miniatures and tagged architecture, dollhouses, miniature bricks, miniatures, N.A.M.E., Victorian architecture, work style. Bookmark the permalink. Always loved your bricks, especially on the 20th St. Emporium. I do plan on a trip from Seattle to Astoria, a few weeks from now in August, to visit the nautical museum. I can offer free transportation at that time back to Seattle for the tiles for any buyers from Seattle. 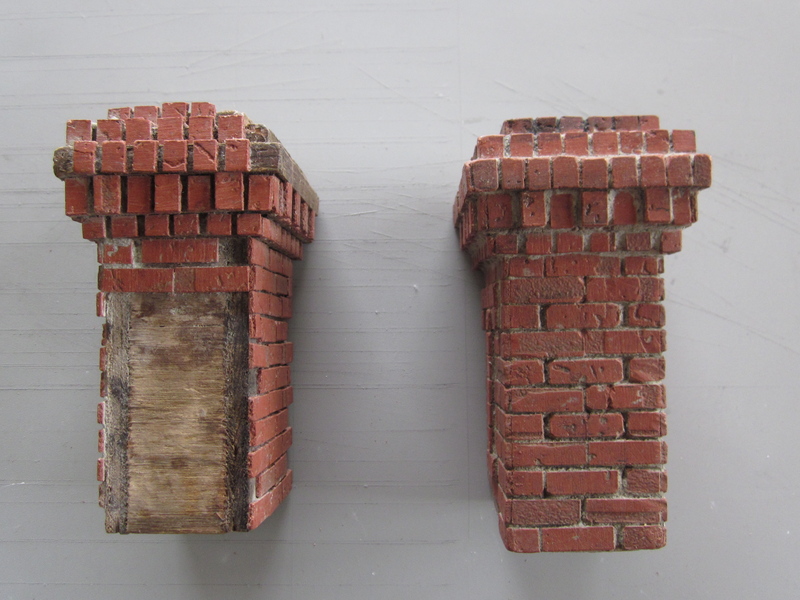 I would probably have been jumping up and down to buy the box but last year having a need I figured out a way to make realistic looking antique bricks from Activa air drying clay and also from real clay that I fire in a kiln. I have wondered a few times if the name of this project is related to the window in the chimney feature. When driving into the town of Port Townsend, WA. 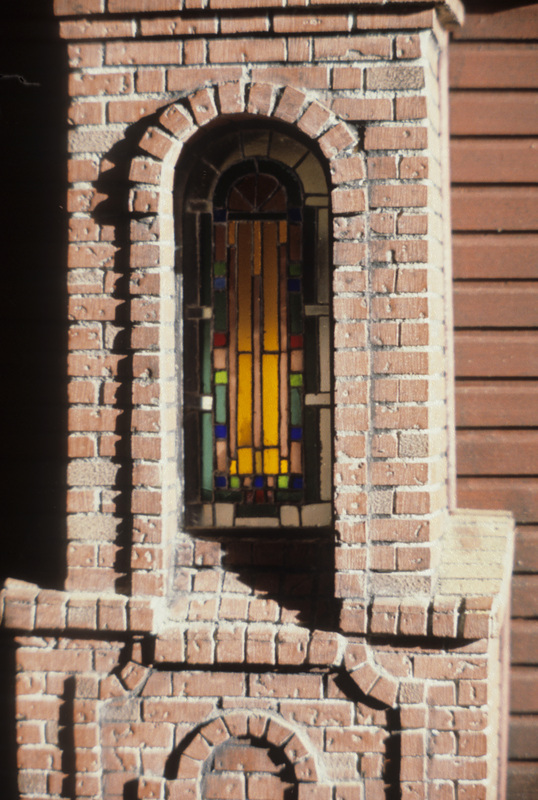 the first big Victorian mansion one reaches on Sims Road has a stained glass window in the chimney of the dining room. That is the J.C. Saunders house. It is hard to see the chimney in the summer time with leaves on the shrubs and trees but in the winter it is visible. I know you have seen that chimney when visiting Port Townsend. Great observation! It’s possible we saw that house in PT, but I have no recollection of it now. It might just have been serendipity. And your brick solution sounds great. Thank you for the offer of brick transportation to Seattle–as of at 8:00 a.m. PDT Sunday the 17th there are 35 tiles left. This is a link to a collection of blog postings about my brick making adventures. I need to go back someday and put it into standard step by step format. But that won’t happen this summer. They look great, Karin! Definitely a good solution to the brick problem. like the one in your blog article? Alas, they are no longer available, and haven’t been for at least a decade. Our students spent a great deal of time combing close-outs, and etc. but no more have surfaced. Thanks, Jacqueline. I’ll send you a prize if you find any! Pretty! This was an extremeely wonderful article.